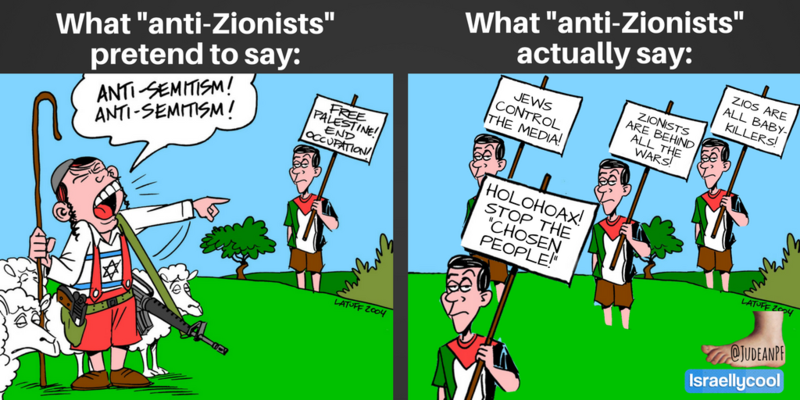 The accompanying image juxtaposes a cartoon that defends protesters against Israel on behalf of Palestinian rights by denigrating pro-Israel concerns, with another cartoon that portrays such protesters as actual antisemites (click here for more readable cartoon imagery at a pro-settler website). This juxtaposition suggests the complex of conflicting passions and rights confronting The Third Narrative (TTN) community. In point of fact there’s a mix of right and wrong in both pictures; some Zionists also oppose the suppression of Palestinian rights, and some activists against Israel are antisemites. The Alliance for Academic Freedom is an organization of liberal and progressive academics that combats infringements on academic freedom relating to the Israeli-Palestinian conflict on college campuses, including academic boycotts of Israel. We oppose the Anti-Semitism Awareness Act now before the U.S. Congress because we believe it endangers academic freedom, too. We believe its language could encourage punishments of legitimate expressions of political opinion. We don’t believe that Congress should be in the business of setting forth official definitions of ant-Semitism. And we do not think any definition of anti-Semitism, including one originally drafted with the needs of European data collectors utmost in mind and then adopted (with minor changes) by the U.S. Department of State for diplomatic purposes, has any legitimate application by Congress to contentious political speech on campus. Some of us are scholars of anti-Semitism. We are aware that anti-Semitism’s manifestations change over time. There is a robust debate, both inside the Jewish community and among experts on the issue, over the relationship between anti-Zionism and anti-Semitism. Sometimes anti-Zionism constitutes anti-Semitism; sometimes it doesn’t. Regardless, Congress has no business deciding when it does or doesn’t, nor should it be in effect stating that political expressions it deems anti-Semitic are essentially presumed relevant to a Title VI case. Such complex concepts should be discussed in classrooms, not legislated by Congress. The State Department definition contains examples of anti-Semitism that are related to criticism of Israel, including applying double standards by demanding it behave in ways not expected of other democratic countries or denying Jews the right of self-determination by claiming that the existence of Israel is a racist endeavor. There is a difference between the Department of State using the definition in its bilateral and multilateral relations (calling out the leadership of Iran that has wanted to wipe Israel off the map, for instance) and using the definition to punish an American campus community, populated with young adults who should be challenged to engage with difficult and contentious ideas. We also worry about a chilling effect. Since a violation of Title VI of the Civil Rights Act of 1964 might have significant financial implications for a university, administrators would have a motivation to crack down on campus speech that outside groups might claim violates the definition. Faculty members would have reason to shy away from teaching controversial perspectives about contemporary Israel and the Middle East. Students may find legitimate political debate stifled. Proponents of the act say the definition set forth is necessary to determine whether a Jewish student has been harassed. That is simply not true. Jewish students are protected under the law as it now stands. In 2010, the U.S. Education Department clarified that Title VI, which prohibits discrimination based on race, color or national origin in federally funded programs, also protects Jewish students. As a result, Title VI cases have in the past succeeded when Jewish students have faced significant harassment or discrimination. Just as there has been no difficulty finding Title VI violations based on racism without an official definition of racism, so anti-Semitic harassment can be punished without this definition. Those two legislative changes will help our government protect Jewish and other students from harassment, while upholding academic freedom. In contrast, adopting an official definition of anti-Semitism might exacerbate student conflict, damage academic freedom, chill speech and harm the academy more broadly. Adoption of the definition by Congress could also put students with a variety of critical views about Israel in jeopardy. To view this article at the Inside Higher Ed website, and read the comments posted there, click here.